Inspired by a DJ quilt I found on Pinterest I decided to embark on my DJ Journey. I've decided to document my journey and share the helpful tips I discovered along the way. After much procrastinating I realized this project could easily overwhelm me so I checked to see if there were any women in my quilting group that wanted to do it along with me. I was surprised to discover that 10-15 women showed interest and several had already started (a long time ago & had their blocks now tucked away in boxes/folders) but no one had completed their quilt (so glad I'm not doing it on my own!!). Now there is a nice group of us taking this journey together and inspiring each other with our completed blocks. Below are some of my completed blocks. There is quite a bit of information about this quilt on the web so I'm only adding a very brief summary of how this quilt began. For more detailed information visit Brenda Papadakis's site www.dearjane.com. Brenda has been the major driving force for this quilt becoming so popular! 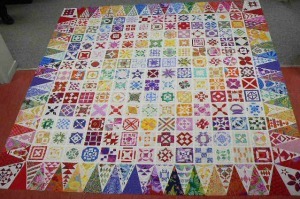 In 1863 Jane A. Stickle finished making a very large sampler quilt. She made it from 225 blocks (169 central blocks, 52 border triangle blocks and 4 corner kites). I haven't counted the number of pieces used to make this quilt but there evidently are 5602 pieces according to Jane as she signed her quilt on a corner block with "In War Time 1863, Pieces 5602, Jane A. Stickle". This quilt can be viewed in The Bennington Museum and has inspired many quilters to make their own versions. 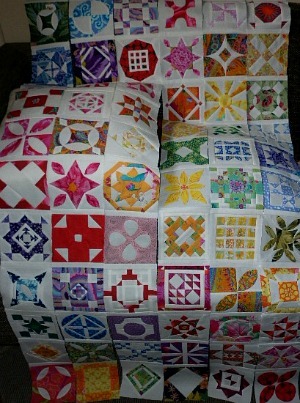 Searching the web for quilts made using some or all of Jane Stickle's blocks shows how popular this quilt has become. There is every color combination you can imagine. Some quilters have tried to replicate the original quilt while others (like me) are making their own variation. In 1996 Brenda Papadakis produced a book containing all the patterns for the blocks in the original quilt. I have seen this beautiful book she produced. Buy this book or the software to use to make your quilt. Sites I have found invaluable while taking this journey. Here you can find a wealth of valuable information about this quilt. You can buy the book as well as the templates used to accurately trim each block (I bought mine here). 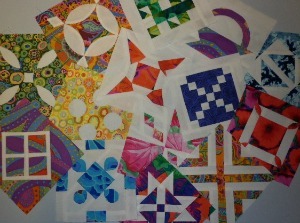 One quilters journey creating her blocks and how she creatively interpreted the patterns. This is where I purchased the computer software program to make my quilt. I am going to categorize my blocks according to the quilting method I used. There are some blocks where several techniques are used to complete the block and these I will place in the combination section. Each page will briefly describe the technique I use and then show the blocks within my DJ quilt that I have used this method on. I hope this is helpful and inspiring to other quilters. Below are my center 169 blocks that are sashed in the rows only. 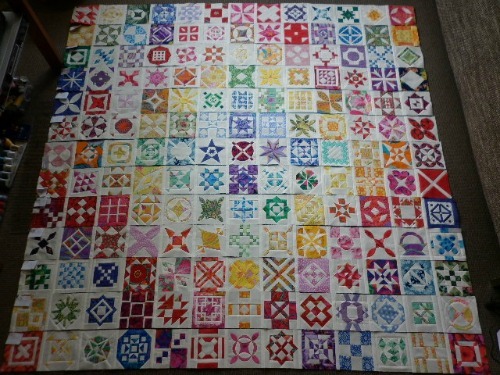 I've laid them out ready to measure each row to see which blocks need adjusting before adding sashing between each row. Placement of some of the blocks does not match the original quilt as I needed to swap a few blocks to give a better color balance. Above is my quilt top with the triangle block borders added. I just need to pluck up the courage to make the scallop border - hopefully sometime later this year! !